Should the group cancel the reservation with a prevoious notice of 48 hours there will be no charge on the credit card provided, otherwise full amount due is charged. 50% deposit is required when booking for a large group, if for some reason the reservation is canceled past the 48 hour notice, there will be no refund. 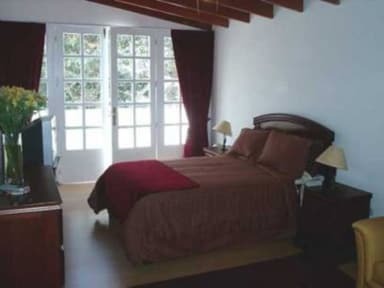 Casa Bella offers you a pleasent and comfortable stay complemented with a touch of personalized and friendly service. Our limited twelve-room old style Lima mansion, give us the opportunity to treat our guests in a very unique manner, treating their needs in a very rapid pace, creating solid bonds, and building long-lasting relationships. Our guests are able to experience a warm family atmosphere, living the day-to-day traditions of the Peruvian lifestyle and exchanging cultural values with Casa Bella family members, our staff, and with other guests as well. This is an invaluable advantage that even five-star hotels are not able to provide. We know location is important for our guests and Casa Bella couldn't be better located. 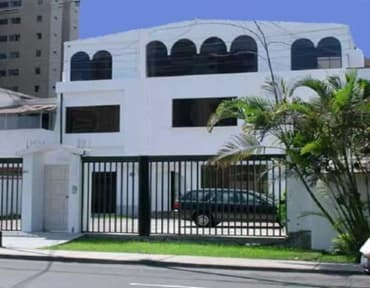 We are just 10 minutes drive from Mirafles Central Park, 10 minutes from Downtown Lima Historical Center, two blocks from the Country Club, two blocks from the Lima Golf Club and just 5 minutes drive from the Pacific Ocean. We are surrounded by residential homes, historical parks and five star hotels. Youll also find shops and restaurants like Starbucks just across the street. We provide our guests with wireless internet access and we also have two desktop computers distributed along the halls. We offer airport transfers at a rate of US $20.00 up to four guests, we send a private sedan with a Casa Bella driver to provide the transportation. Free continental breakfast is served everyday from 7 a.m. to 10:00 a.m. All our rooms are equiped with private bathrooms, double size beds or queen beds, telephones, DVD, and Cable TV. Rooms for large groups are also available.